My 24 year old brother, Rakesh, was diagnosed with Chronic Budd Chiari Syndrome (blocked RHV and MHV) liver disease, in May 2015. Problems with intestinal blockage and blood clotting led to his liver being damaged. My family and I am very sad to hear of his condition due to which he is in hospital at such a young age, in need of a liver transplant as soon as possible. We are reaching out to you as our only means of financial assistance. I stepped forward to personally help my brother in his condition by offering to be a donor. However, my blood group's subtype did not match with his. My sister also tried; however, unfortunately, hers too was deemed unsuitable for him. 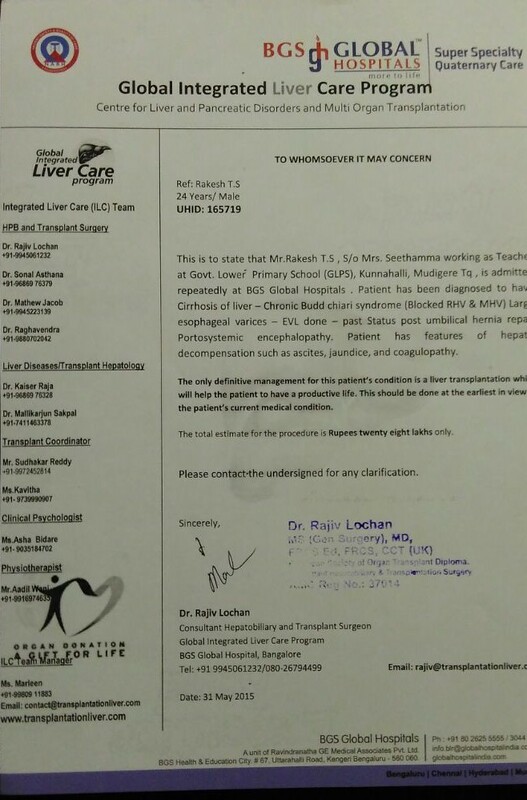 Rakesh needs a liver transplant in order to beat his illness. Our parents also came forward as donors; however, they are both over 50 years of age, and therefore not suitable as donors either. We are trying to identify a donor who could be a match for Rakesh. I had to quit my job to take care of my brother. My mother is a primary school teacher, and my father was in a private job. My sister is still studying. The operation will cost us Rs. 28 lakhs. We are not in a financial situation to arrange this amount of money. Rakesh was supposed to undergo a surgery to correct an intestinal problem, but we cannot go through with the procedure as he is underweight. We have already spent Rs. 12 lakhs so far on his treatment and do not have sufficient funds for the transplant. 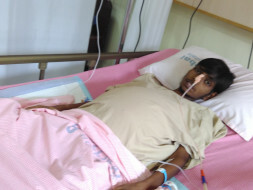 He is currently admitted in BGS Global Hospital, Bangalore. I have attached the estimation letter from the hospital below. I request support from you in helping my brother get back on his feet. Please consider making a small donation. Every bit counts!